Anterior blepharitis – affecting the outside front of the eyelid where eyelashes are attached. Posterior blepharitis – linked to dysfunction of Meibomian glands within the eyelids that secrete oils to help lubricate the eye. Staphylococcal blepharitis – frequently associated with mildly sticking eyelids, thickened lid margins, and missing and misdirected eyelashes. Seborrheic blepharitis – frequently associated with greasy flakes or scales around the base of eyelashes and a mild redness of the eyelids. 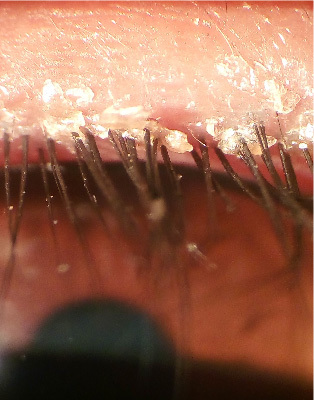 Ulcerative blepharitis – frequently associated with matted, hard crusts around the eyelashes. Removing the crusts leaves small sores that ooze and bleed. You may also experience eyelash loss, distortion of the front edges of the eyelids and chronic tearing. In severe cases, your cornea (the transparent front covering of the eyeball) becomes inflamed. Meibomian blepharitis – associated with blockage of the oil glands in the eyelids, poor quality of tears and redness of the lining of the eyelids.